Interviewer: What do you define as cheating? Student: I don’t know what cheating is, honestly. Interviewer: Would you say that you cheat? Interviewer: Do you consider yourself a cheater? 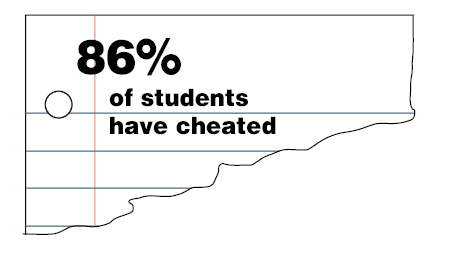 Students often brush off the idea of being a cheater, believing they are not affiliated with the term. However, cheating can be so ubiquitous on campus that many do not consider the moral implications. According to Conejo Valley Unified School District (CVUSD) policy, academic dishonesty is defined as “a deliberate attempt to disrupt the learning process by misrepresenting another’s work as one’s own.” Glancing at another student’s test, asking for answers on individual assignments, looking up answers online, or plagiarizing someone else’s writing are all district-specified forms of cheating. Those who let others cheat off of them, whether they provide images of homework or the answers for a test, are also considered cheating offenders. In general, educators and teachers follow this official definition of cheating rigidly. 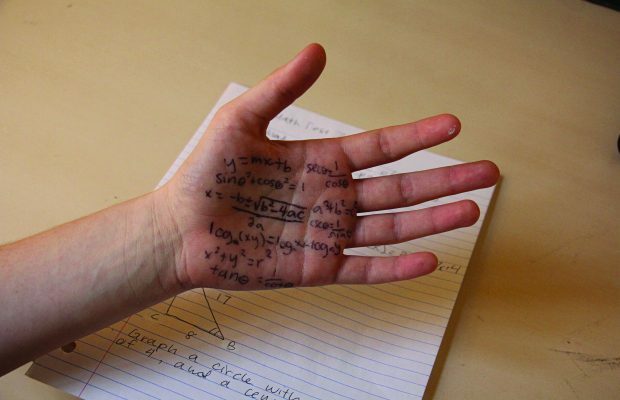 Some students, however, may have a murkier interpretation of cheating, as some actions seem ethically reasonable. Although there are varying opinions on what cheating truly is, the underlying factor is that it continues to occur in the classroom, breaking school policies. Academic dishonesty comes in many different shapes and forms. Although some students do face the administrative consequences of cheating when caught in the act, others have also developed ways to avoid teacher awareness of their actions. 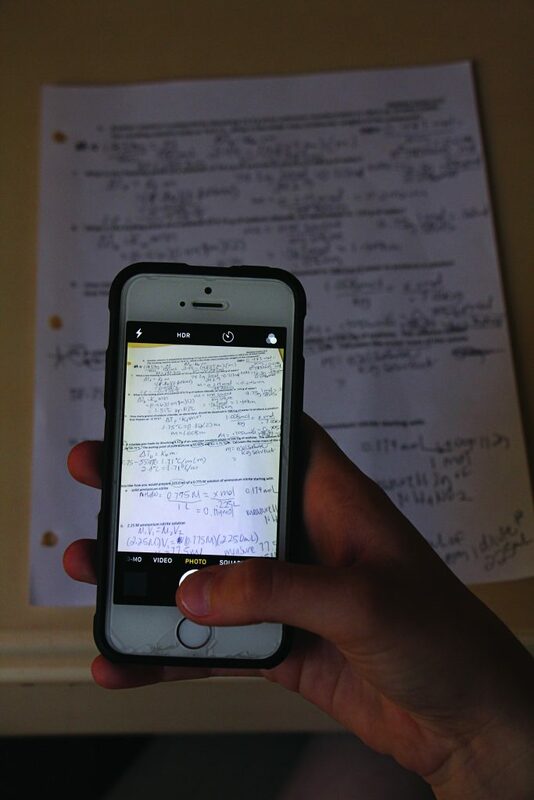 A common form of what the district defines as cheating concerns homework. 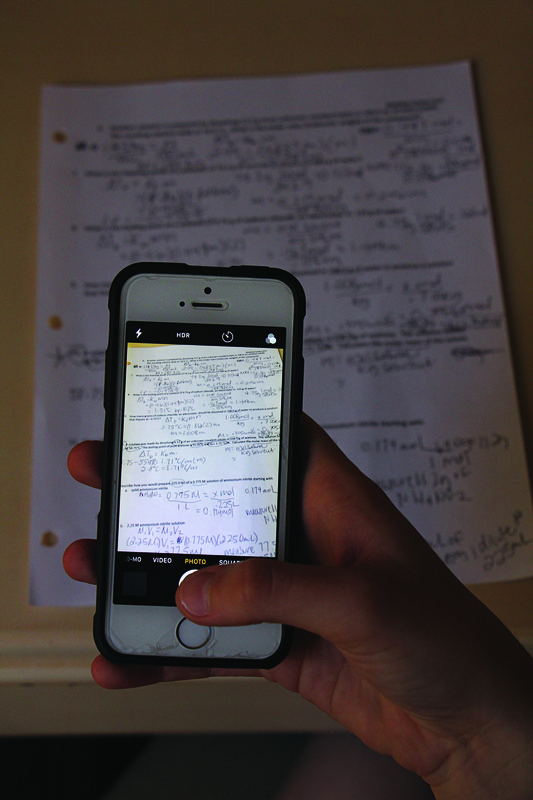 Although it is difficult to catch and a generally more relaxed area, copying an assignment, sending a picture to a friend or even looking up answers online all fall under academic dishonesty. Although quizzes and tests are administered in more stringent environments than homework and classwork, they too are not immune to students’ cheating methods. Tiffani Coull, history teacher, recalls a group chat that disbanded, by her force, earlier this year, in which students would collaborate to get answers on daily quizzes she administers. “The A days would put on the group chat all the answers to the reading reviews so the B days would get it right and then when we switched at the semester, the B day did it,” Coull said. Aidan Anderson*, senior, recalled a class wide cheating scandal on his final science exam. While some athletes in the class managed to convince the teacher to sign yearbooks, Anderson searched through the teacher’s desk to take pictures of each page of the three versions of the final test, which he texted to the whole class. The plan was complicated by a student who revealed the situation to the teacher. Although the pictures were deleted to avoid conflict, some students were able retain them through another class member and re-circulate them. Susan Baker*, sophomore, considers herself to be a relatively avid cheater who has not yet faced administrative consequences. In a current class, during tests, Baker admitted to swapping multiple choice Scantron sheets with two neighboring students. By the time students enter high school, each and every individual has been taught that cheating is immoral and will be dealt with through disciplinary action. However, as one steps into the halls of high school, those lessons begin to fade away in light of new competition and stress. 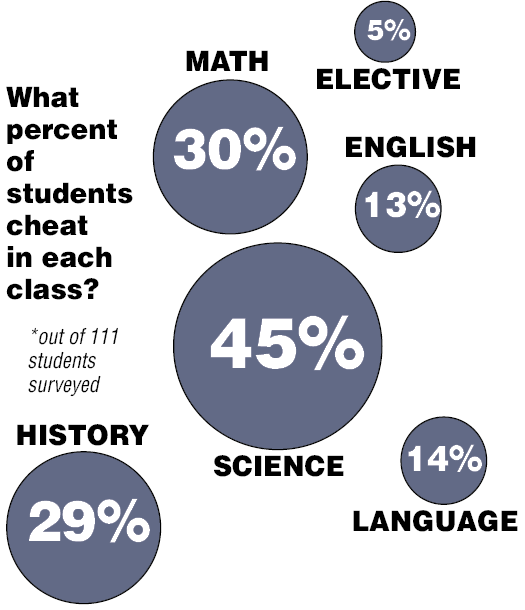 The question that stands is, why do students cheat when they know it is wrong? Several teachers believe that it is a direct result of the pressure and competition between students. Ella Hall*, senior, recalls when she cheated in middle school. Her reasoning included both the pressure to do well and the idea that cheating was the norm. “I cheated because I thought everyone was doing it and I wanted so badly to score high that the means to getting to that ideal end no longer mattered to me,” she said. Baker also justified that her collaborative cheating in exchanging Scantron sheets was not necessarily her fault; she felt that the class cultivated an environment in which “no one knows anything” and a realistic balance needed to be maintained. To dissuade and punish academic dishonesty, CVUSD policy has established rules for two infractions for students in grade 9-12. The first offense will result in a two-year Academic Dishonesty Contract signed by the student, parents, and an administrator, while the second offense in any class within the two-year period will result in the student being drop/failed from the class and enrolled in study hall instead. In all science classes at NPHS, students review and sign a specific academic dishonesty contract at the beginning of the class. If Harris catches a student cheating, “I first speak to the students, all students involved, then I call their parents, and I speak to them, then I write a referral and give it to administration, and then they deal with the consequences from their end,” she said. “Students will take a zero on any assignment that they are caught cheating on.” Dogancay, among other teachers, adhere strictly to the district policy. Some believe these consequences are too severe. Other students disagree and prefer to trust the administrative justice system. “I just know of a lot of cases where people have cheated or been in a gray area and admin or teachers made another deal with the kid instead of writing them up because of the length of the paperwork, which I think is a fault in the system,” Hall said. Whether academic dishonesty has immediate consequences or not, some long term effects may still persist.